AND THE WINNER IS: (drum roll please ..... ) SUSAN LILES! CONGRATS!! Susan please send me a private email with your address and I'll get your goodies mailed out to you. Ladies - thank you, thank you, for playing - it was fun!!! hatnk you, for playing - it was fun!!! Happy Valentine’s Day…May the chocolate be with you! I'm very excited that my blog has over 1000 hits - I hope those of you that are stopping by are getting a little inspiration from some of the postings. Here's the goodies I promised - some really cool CTMH Chocolate and Bamboo Standard and Bigger Brads - 48 in all, also a yard of CTMH Designer Ribbon and two sheets of CTMH Vellum stickers. Everyone can enter - it's very simple - just add you name in the comment section here - all the names will go into a hat and I'll have my DH, of twenty two years, draw a name on Friday (2/16/07) - so you have two days+ to add your name. Have fun and good luck. I decided BINGO balls would work better - I'll keep drawing balls until one of the numbers falls within the post numbers - double posts will not count :-) - I have a class Friday morning - I'm going to try to get to this before class - I'm excited to see who wins!!! No more entries considered after 6:00 AM - Friday, February 16, 2007 - Good Luck!! It's almost time to annouce the WINNER!! I will be adding a couple of my altered playing cards - would you like that - here is a little sample! 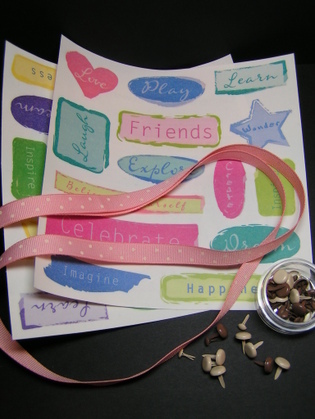 Check out the More To Adore Class to see how I've used it on a scrapbook page! Scroll down a little futher and you'll see how it's used on the front of a card. ooooh -- pick me! pick me! I'd LOVE to win stuff! Happy Anniversary! Wow, 22 years! Congratulations! If I have two days to enter my name, does that mean I can enter more than once? Darn! I wasn't the first poster. Should have taken the opportunity when I was up at 6 am checking for school closings! Anyway, Happy Anniversary and Happy Valentine's Day. Congrats on 22 years of wedding bliss! Good snowy morning!!! Since we are all trapped inside I final made it to check out your blog! Must mean I am going to win!!! Happy Valentine's day! Happy Anniversary! Love is in the air??? Happy Anniversary. Great items for the contest! 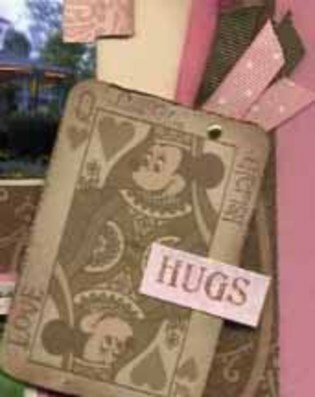 And I love the "Hang in there" card - great charm. Have a great day. Wow! 22 years. Congratulations! Happy Valentine's Day. Awesome! Have a great day!!! Awesome! 22 years - wowza! Big congrats. Hope you have a happy valentine's day! Wow, great blog candy! I just found your blog through Allison's a.k.a. THE source for all stamping related blog candy contest info:) I look forward to purusing your blog! What fun blog candy! Happy Valentines and Congrats on 22 years! That's so fun! You are amazing, Linda. Thanks for the inspiration - and the blog contest. Happy Valentine's Day. OOHH!! i love all that stuff!! i think i need to do a contest soon! this looks fun!! happy valentine's day one hundred times over! May the chocolate be w/ you also!! LOL I would love to get my hands on some CTMH items...and a catalog too! *wink* TFS!! I love CTMH! This is my first visit but I will be back often! and thanks for the blog candy!! OH MY! You've sweetened the pot with that adorable playing card?! Luckily, I'll get one (or two?) at the workshop! I need a doggie for my Marley. Its been so sad here since Clancy died. As soon as the weather breaks, I am going to the HS to see if they have a buddy for him. Congratulations of your 1,000th comments! Love the Disney altered playing cards. My pages turned out great!. Just wait till I add pictures from my Disney cruise.